It is still unclear what prompted the retirement in 1857 of this pioneer at the age of 50. Had his job as Chief Inspector of Machinery taken its toll on his health? Had he foreseen the waning influence of the East India Company long before what is traditionally called the Indian Mutiny (also known as the Sepoy Revolt or the Indian War of Independence)? Or had the 1850s wrought such changes within the Parsi community that he opted to return to England? Or did a lady called Marian Barber hold the key to his last trip to England in c.1858? In December 1853 Ardaseer’s name appears as the father of Lowjee Annie, born to a Marian Barber (1817-1899) in Bombay. Her second child by him, a son named Gustasp Ardaseer, was also registered in Bombay, in 1856. Marian’s parents both originated in Suffolk, but by the time of her birth they had moved to London. [i] The 1841 census shows the family as living in the Hamlet of Mile End Old Town, Tower Hamlets, (where they lived for over three decades), her father William ‘employed by the Customs’. 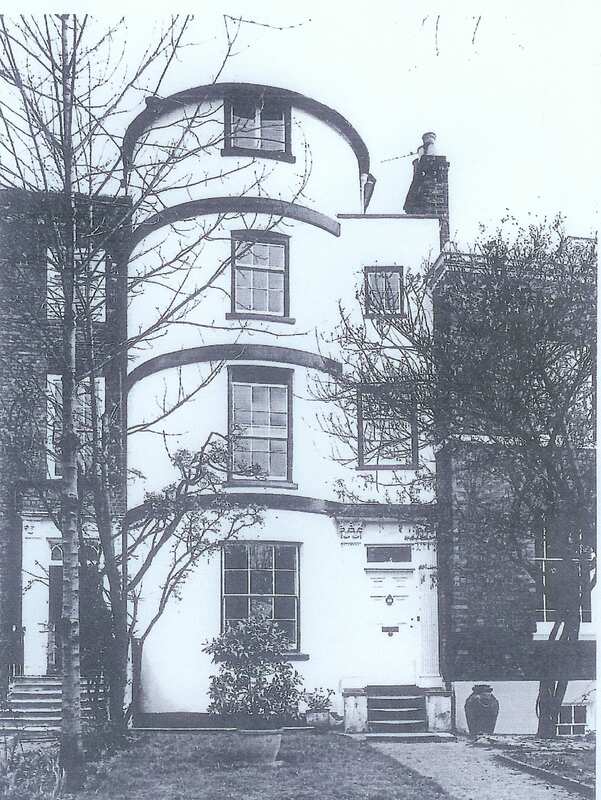 Here were newly built stuccoed houses, within easy access of Stepney Green which even in the mid nineteenth century must have been, according to Pevsner, ‘pretty and peaceful’. By the 1851 census one of Marian’s brothers William is revealed as ‘Formerly a check clerk in London Docks’ (was it through him that Ardaseer met Marian?) . For much of Ardaseer Cursetjee’s stay in England in 1839-40 he lodged in Limehouse, no more than a mile from the Barber family in Mile End, and connected from 1810 by the Commercial Road which linked Shadwell, Limehouse and Poplar with the City. Furthermore a ‘Mrs Barber and servant’ appears in the passenger list of the Achilles, leaving Bombay for England in 1851, near to that of Ardaseer Cursetjee. [ii] Had they met in Bombay before the sailing? Or had they met eleven years before, in London? If so had she gone out to India to work for him? Was she now his nurse or travelling companion? Or had Marian been acting as governess for his children in Bombay? Marian was clearly back in Bombay by March 1853 to conceive their daughter Lowjee Annie. She was still in Bombay in November 1856, but had returned to London by June 1859. We know this from her children’s place and date of birth: Lowjee Annie born 25 December 1853 Bombay; Gustasp born November 1856 – Bombay; and Florence Victoria born 22 June 1859 – 34 Essex Street, parish of St Clement Danes, Middlesex. Ardaseer Cursetjee did not marry Marian. In his will he refers to her by her maiden name, but he identifies her as the mother of his children. Ardaseer remained married to his wife in Bombay, and marriage to Marian would have been prohibited by English law. Furthermore at this time there was a much documented legal case in progress that while not specifically relating to him, must have raised some disquiet. The case of Perozeboye v Ardaseer Cursetjee of Bombay was filed in November 1853 requesting that the defendant ‘do take back his lawful wife and treat her with conjugal kindness and to provide for her alimony in the event of the said Ardaseer Cursetjee refusing her back’. [iii] Furthermore the later Parsi Marriage and Divorce Act of 1865 (in India) explicitly ruled out bigamous marriages, which had begun to occur with the weakening influence of the Parsi Punchayat [Synod]. Although Ardaseer took up the appointment as Chief Engineer of the Indus Flotilla Company in Karachi in 1861, taking charge of the Company’s steam branch and workshops at Kotree in Sind, it seems likely that he worked from London. No records have been found for his activities in Karachi, nor of his travel to and from this post, from which he resigned in 1863. The Company, established in London, operated steamships which sailed on the River Indus between Hydrabad and Moolton whence a railway took passengers and goods onwards to Lahore. The unreliable river link was replaced by rail in 1865. The census record for 1861 shows Ardaseer Cursetjee living at 6 Montagu Place, Hammersmith, the other residents are Lowjee Annie his daughter aged seven, Gustasp his son aged four; his second daughter Florence Victoria aged one and Emily Rosina Willshere, ‘Governess to little child’, together with a cook and a general servant, but with no trace of Marian. The following year all the family was living at Upper Mall, Hammersmith, an address recorded in Lowjee and Gustasp’s baptismal records. The houses at that time were mostly eighteenth century, the end fizzling out into the Water Works of which the Engine House had been built in 1811-12. It was however even in the 1850s rural, with plenty of open country between the main roads, although the population had grown from 13,000 in 1841 to 25,000 in 1861. Figure 7. Lowjee House, this property in Richmond (seen looking south across Sheen Road) was occupied by Ardaseer Cursetjee and his family until his death in 1877, photograph taken 2011. Image courtesy of Blair Southerden. From 1863 the family lived in Richmond. The 1871 Census shows Ardaseer and Marian Cursetjee aged 62 and 54 respectively with their children Lowjee Annie 17, and Gustasp 14, and Ardaseer’s grandson Cursetjee Rustomjee, 16 living at Lowjee House, Richmond, Surrey (see figure 7). The household was completed by a coachman, cook and housemaid (both widowed), the latter’s daughter and two female visitors from London. Florence was not far away, boarding at Madeley House School near Richmond. Lowjee House still stands, a grade 2 listed building, described as part of a Georgian terrace. From the exterior architecture it looks as if it had recently been remodelled, possibly in the 1810s-1820s. It stands proud of the flat brick facades of the attached houses with its striking four-section cylinder tower frontage. In 1998 the accommodation was described as including a reception hall, cloakroom, drawing room and sitting room, with five bedrooms. The Richmond Directory for 1876 describes the other occupants of premises on the south side of Marsh Gate Road (changed in 1892 to Sheen Road), where Lowjee House was situated as James Bonella of the Red Cow [public house], W. Pyke greengrocer and fishmonger, and Richard Mole beer retailer, then Ardaseer Cursetjee at Lowjee House, probably at number 41. While the first part of the street housed shopkeepers, the next houses: Matson Red Lodge, Matson Lodge and Matson Villas were home to gentlemen who did not identify themselves by occupation, and at the end of the street Robert Harmer MD lived at Court Lodge. In 1876 Ardaseer Cursetjee was to write his carefully worded will from Lowjee House, where he died the following year. He bequeathed to his wife Awahbai, left behind in India, ‘for her own use and benefit all the real and personal estate and effects derived from her late Father or Mother or any of her other relations and all accumulations thereof respectively’. To his family in England he detailed more personal effects, to his daughter Lowjee Annie he left his diamond ring ‘and my portrait of myself painted in oil and all my plate and plated articles which shall at the time of my death be in or about or belonging to my said dwelling house called Lowjee House’ To his son Gustasp he bequeathed ‘his watch and chain and mechanical piano fork’. To his grandson ‘Cursetjee Rustomjee of Her Majesty’s Indian Civil Service’ he left ‘my gold signet ring’ whilst to Marian he left ‘all jewels and the articles and things usually worn or used by her and which from time to time or at any time given or presented to her by me’ as well as £100 legacy and an annuity of £50. He further directed that ‘Lowjee House where I now reside in … be vacated by my family as soon as conveniently can be after my death and that thereupon such portions of the furniture and articles of domestic use or ornament which shall be in Lowjee House at the time of my death (except what are hereinfore specifically bequeathed) as shall be jointly selected by the said Marian Barber and Lowjee Ardaseer shall be removed at the expense of my estate to furnish the said No.5 Woolmer Cottages, The Grove, Hammersmith upon trust during the life of the said Marian Barber to permit her and such of my said three children as being unmarried shall be desirous of residing with the said Marian Barber to have the use occupation and enjoyment of the same premises and furniture. … And I direct that an Inventory of the said furniture and articles shall before or upon being removed … be made out and signed by the said Marian Barber and that such an inventory be kept in the custody of the said Executors and Trustees’, although she was not to be ‘in any way liable for or concerned to see the custody or preservation of the said furniture and articles on any portion thereof’. Unfortunately the inventory has not come to light, so we cannot reconstruct how it was furnished and how Indian and English conventions might have been combined. Succeeding generations of Ardaseer Cursetjee’s family were to shuttle back and forth between India and England, creating complex and intimate ties. For example Cursetjee Rustomjee (1855-1941) stayed with his grandfather in Richmond, connecting through his presence both Indian and English families. He had been sent to England after leaving school to study for the Indian Civil Service entrance examination. He matriculated at London University in 1874 and enrolled as a student at Middle Temple in the same year. He was successful in the India Civil Service examination in 1876 and returned to India that year. He was posted to Allahabad as an assistant magistrate, but returned to England on leave in 1880 marrying Lowjee Annie (1853-1894), his aunt (his grandfather’s daughter), that year, causing an uproar within the Parsi community. Their three children were all born in India, where their father pursued his civil service career in the United Provinces, as Assistant Judge in Allahabad (1902), Judicial Commissioner at Lucknow (1904) and Acting Judge at Allahabad High Court from 1906 until his retirement in 1911. He returned to England soon after and died in Matlock, Derbyshire in 1941. Figure 8. A stamp in a series issued by the Indian Post Office in 1969 commemorating Indian scientists. Image courtesy of Blair Southerden. 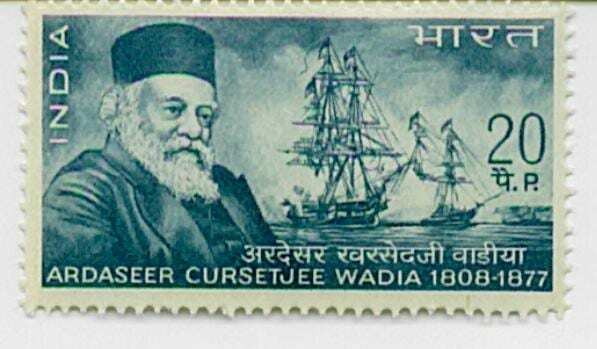 In May 1969 the Indian Post issued a commemorative stamp celebrating Ardaseer Cursetjee, ‘in memory of this great son of India, pioneer and innovator’. His portrait to the fore with the sailing ships with which he was associated in the background However as R. Kochhar has commented although the British ‘were happy to patronize Cursetjee for trying to improve his country and countrymen … his own country was not impressed and ignored him completely’. [v] Even a two volume history of his own community, published in 1884 while devoting seventeen pages to his family, and noting his two cousins who visited England, fails to mention him. Kochhar suggests that it was because he ‘was at that time leading a retired life in far-off England’. This was one of the penalties of Ardaseer’s decision to create an English rather than Indian home, made possible by his association with the East India Company. We know that many British East India Company servants formed liaisons with Indian women, particularly in the eighteenth century. Some took the bold step of marrying, and bringing their family back to Britain. Ardaseer Cursetjee’s story shows how one Indian reversed the pattern. Movement back and forth between India and England helped shape family identities, and Cursetjee and Marian’s life, and the relationship between Cursetjee Rustomjee and Lowjee Annie, begs important questions about the dynamics and boundaries of these identities. [ii] Bombay Calendar 1854, transcribed by Families in British India Society (www.fibis.org). [iii] Reports of cases heard and determined by the Judicial Committee, 6:8, p.376. This case came before the Privy Council in 1856 on appeal from the Supreme Court. The findings that it was impossible to apply the law of the Diocese of London, a Christian law to persons professing the Zoroastrian religion were to be much quoted in future cases. [iv] Obituary of Ardaseer Cursetjee, Proceedings of the Society of Civil Engineers, 51 (1878), p. 271. [v] Kochhar, ‘Ardaseer Cursetjee’, p. 46.